Combine the pistachos, lemon juice, garlic, salt, cumin, smoked paprika, and half of the olive oil in the blender. With the lid on and the blender running on medium low speed, drizzle in the remaining oil and then the water, stopping to scrape down the sides as needed. Blend until color lightens and fairly smooth but not completely textureless. You may need to add a little more water. Taste and adjust seasoning; it will likely need more salt and possibly more lemon juice or spices, but don’t overpower the pistachio flavor. Reserve, with plastic wrap on the surface to prevent oxidation. Preheat oven to 400°F. Toss the asparagus with a bit of olive oil and sea salt. Roast on a baking sheet until tender, about 10 minutes. Turn on broiler and cook until blackened in spots. To serve, spoon the pistachio puree on a plate and place the asparagus on top. Garnish with the balsamic vinegar, chopped pistachios, flaky salt and snipped chives. Wow, this could also be great just like a pesto “sauce” for pasta… love pistachios! I think so too Sally. This was so wonderful and I expected it to be rich. Not at all. Sort of a nut butter, yet savory and not so thick. Love the pistachio nut purée! It’s wonderful Elaine! Worth every expensive penny the pistachio’s cost. Thank you Joanne. It was fabulous. Pistachio’s really make a wonderful nut butter. Yet this was creamy, a little crunchy and a delightful dip for many other foods I can imagine besides asparagus. Funny you should mention it because at first I had a few bites without the balsamic. Then after my first balsamic bite I was delighted! It really was wonderful together. Loved your asparagus post! Looks delicious. Looks tasty! I was just saying last night that I need a new creative way to prepare asparagus. This is it. Oh good! Hope you get a chance to try it. It really is a wonderful combination. I think the recipe originated at a very fine restaurant here in Seattle! Pistachios sounds like a fantastic base for the “puree,” and I’ve never thought to broil the asparagus to get it nice and blackened. Thanks for sharing this one! Hello! :) I looked at your recipe and I can see why your husband’s family loved it! Fantastic! I want to try the pepita pesto with asparagus. Sounds amazing. Hope you make the puree too. It’s something special for sure. Such a clever idea, I bet you can use that puree so many different ways. Love asparagus and this is such a great way to prepare them. I thought it was very clever. There is an incredible restaurant here in Seattle who started making nut purees and serving them with vegetables of various sort. This was inspired by that idea. Great idea! Thank you Ken. Certainly enjoyed your pistachio pesto lasagne post. Just can’t get enough of your gorgeous blog. So inspiring and beautifully photographed. Now I know what to do with my big bag of pistachios. Great recipe. Do you call this gourmet or what? Oh wow cottage :). I think this qualifies for gourmet! It is something special, that’s for sure. That looks and sounds amazing! Truly! You’ll be very pleased with it Deena. Such a wonderful way to use pistachio’s. Not like anything I have had before. Very unique and delicious. Goodness! Must try this! I bet it would be delicious bruschetta-style too. I think you are on to something here. This would be wonderful on bruschetta. I think you would really like this Serena. The purée is wonderful. Nutty hommus sounds good to me and that lot looks effing delicious. Nice! The nutty pistachio hummus sounds so creamy, earthy and satisfying. I could definitely enjoy this meal with a few slices of olive farm bread. MMMMM, good stuff! I can’t wait to try it. Olive farm bread! Yes…that sounds like a wonderful combination. Actually I stood over this bowl of purée with a spoon and couldn’t stop. It’s so delicious even without anything to dip other than a spoon. So lovely and fresh! Love the texture of the nuts here. I love the idea of the pistachio puree. Thanks for the recipe! You are very welcome. I hope you get to put the idea into motion and make some! :) It truly is delightful and could be served with so many other things rather than asparagus. Thank you! What an interesting combination. I’m a sucker for pistachios. Now, if only the asparagus will come on… (we’re running a bit behind here this spring). Oh! Another asparagus lover! We really like it too, especially roasted or grilled. The pistachio nut purée was a nice accompaniment. Loving how veggies are taking center stage more and more. This looks healthy and hearty in a strangely light way. Like you could eat a good-size portion and still go in for that bowl of ice cream after the meal :-) So lovely. You are right Liz. Seriously, I could not stop eating the purée, even when I had my fill of asparagus I kept spooning it off the plate and eating it! The balsamic was really good here. Thank you! You really had one of the best ideas ever…. I don’t have so much fantasy with asparagus, so thanks for sharing! The flavor of asparagus can be overwhelming and I don’t think too much about buying it too often. This pistachio nut purée would be very delicious with other vegetables or breads too. Thank you for stopping in. I really enjoyed your tahini buns post. Lovely. I love it that you go from mac and cheese to pistachio puree/hummus, which sounds incredible yet relatively simple to make. It is going on my to-make list! Hi Angie! Lucky…what a nice gift from your MIL. You would be very impressed with this pistachio purée. I saw the recipe and made it that day. I’ll be making it again but next time try something other than asparagus. Nice to see you here, must go check out your FF and see who’s there. :) Hope you getting some garden time in. Finally some sun for us this weekend! 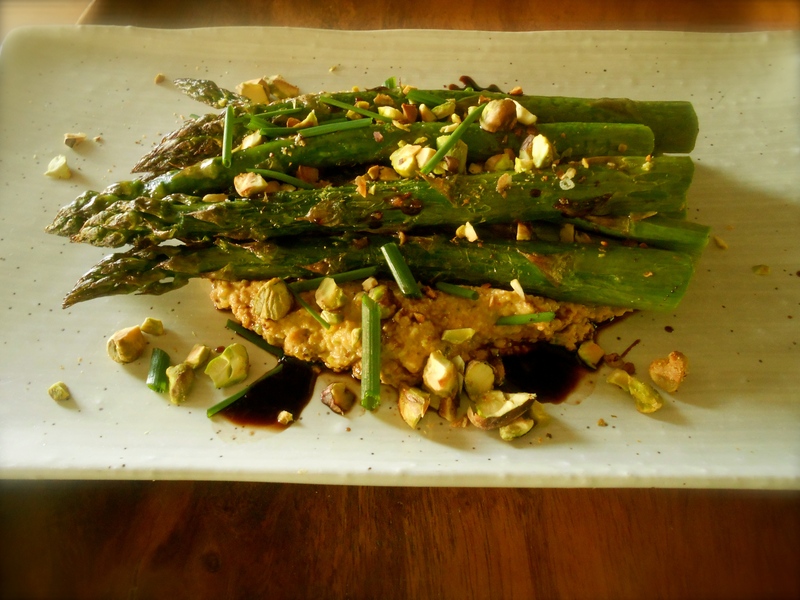 Looks so good with pistachio puree :) Great idea to eat more Asparagus! Thank you! It is a great way to enjoy asparagus. The purée is delicious and if you get an opportunity blend some up…you’ll love it. Thank you. Oh yum… and that hit of balsamic for a little tartness as well… sounds fabulous! That’s it! You are right. The balsamic tartness was really nice here. I love pistachio’s and this was spot on with nutty flavor and a wonderful hummus like texture. Yum. :) Thank you for visiting! This recipe looks and sounds amazing! Thanks for sharing. That’s so nice of you to say – thank you! Look forward to reading more of your posts. Such a beautiful and novel way to serve asparagus. It’s not in season here yet but when it is – I love making a meal out of it – normally with hollandaise sauce but this would make a wonderful change. Lovely photograph and I’m envious of your cookbook collection…. I love hollandaise sauce. I have never been too successful at making a good hollandaise. We did make a meal out of this dish Lindy. Pistachio nut “hummus” was so unique and wonderful. Next time I make it I’ll use other types of vegetables as well. I can imagine an array of grilled vegetables and a big bowl of nutty pistachio purée. Yum. What a great way to make something simple and elevate it with other simple and natural ingredients. Smoked paprika is my absolute favorite. Oh gosh! smoked paprika, cumin and pistachios– love all those flavors and add in the asparagus. it does sound so delicious! Pistachio hummus…now that sounds fantastic, Seana! I just about always roast asparagus these days. If they’re not on the stove top griddle, they’re on the barbecue. They’re just so much better roasted, aren’t they? Now, your pistachio hummus sounds fantastic and I just so happen to have plenty of pistachio nuts lying about. (Courtesy of the pistachio pesto post.) I’m sure that the combo of asparagus and pistachios is wonderful and I’ll be sure to give it a try. Local asparagus is just starting to make an appearance and new recipes are always welcome. Thanks for sharing this one. 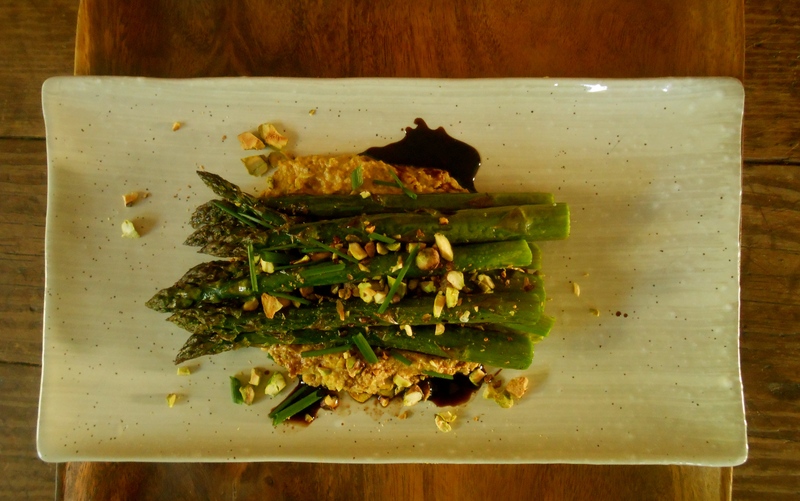 You are currently reading roasted asparagus with pistachio nut purée at COTTAGE GROVE HOUSE.